I don't know whether it's because I'm in those early 30's myself, or because I've just matured (wait...that's kind of the same thing, isn't it? ), but I really enjoy the older heroine. The alleged "spinster." Very interesting (and plausible!) that the age to marry wasn't as young as most people imagine. Teenage marriages were rather medieval, I think--then as much as they are now. By the way, now I have got to add this book to my nonfic collection. Thanks for sharing!! Teen marriages still happened, but they were the exception rather than the rule (Lady Georgiana Spencer, who became the 5th Duchess of Devonshire, was only 17 when she married the duke). This chart derives from a periodical aimed at upper middle class English women, but it looks rather similar to the ages of 100-150 years before. The average marriage age has been a bone of contention on the Downton Abbey boards I frequent since, as you've covered here, the "fact" that aristocratic women married between the ages of 17 and 19, and after that were spinsters, is pretty widespread. I'll also add that complaints about the age span between heroes and heroines is interesting. The age groups of today did not exist until the mid-20th century (1950s-1960s I'd posit), and the general hardships of life meant you were an "adult" once you took on adult responsibilities (work, child-rearing, etc). And within the aristocracy and upper classes, once a girl put her hair up, she was an adult. I think it was Daisy Fingall's memoirs, but she mentioned the abrupt change in her life when she made her debut: she was in the schoolroom one week, romping with her siblings, and the next was wearing evening gowns and being placed beside statesmen and royalty at dinner parties. The entire point of a young lady's life was to prepare her for this moment, so a girl of 19 or 20 was expected to hold her own with a potential suitor of 30 or 40. 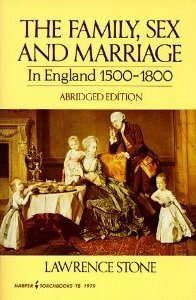 Then too, marriage was legal for a girl of twelve, though menarche was probably still quite a bit later than for the present generation. I wonder though, if there wasn't also a perception by the young ladies that if they weren't married by 21, they were washed up, etc, regardless of the facts. My daughter claims there are still a lot of conservative college campuses where the women who graduate without becoming engaged consider they've flunked their MRS degree. Absolutely will buy the book. Wonderful post, now I'm off to read about how tall people really were. Fascinating stuff and I have got to get this book! Teenaged women is why I don't write YA ! I much prefer to write about a woman in her mid-20's who knows what she wants and goes after it, no matter what the era! Isobel, thanks for the great post. Love finding new reference books, too. I highly recommend Stone's books (An Open Elite?, Road to Divorce, Broken Lives: Separation and Divorce in England, and Uncertain Unions). Really great scholarship and wonderful insights into how people really lived, loved, separated, and divorced. You know, all the stuff that drives our plots. You have to take any historian’s interpretations with a grain of salt, but I personally find Stone's very insightful. I’d temper them with Trumbach’s though. His Rise of the Egalitarian Family is the other side of the coin, showing how the Georgian family was becoming something very like what we’re used to today. And of course there are real life examples that bear out both of these visions of family in the era. I've always preferred the older heroine; even when I was a younger reader I could relate to a less clueless heroine. Maybe it's because I was raised a city girl, or maybe it's because I considered myself precocious. Or maybe (and this is probably more to the point) that with a heroine who has more life experience, the author has the opportunity to create a more complex, deeper, more intriging and interesting character than a heroine who is more of a blank slate. Thanks, Isobel, for sharing this research. I always appreciate your mythbusting. The truth will be accepted in the Historical Fiction community because there really aren't any genre "rules," but how do Romance readers and editors respond to the truth (e.g. a thoroughly marriageable heroine of 24 who is not "on the shelf") when authors present it in their novels? No idea. The editor I was discussing this with never bothered to respond to any of my tweets after I mentioned Stone's work.